I have an issue and I really need some input. Here is a quick back story :The car is a 1997 Audi Cab with the 2.8 12v auto trans front wheel drive. The car has 93k miles. The car was in sad shape when I bought it and I have done a massive amount of work from brakes and suspension to a trans rebuild and engine work. It has been a good car the last few years after I sorted things out. At current it is leaking from the pinion cover which has a crack in it. 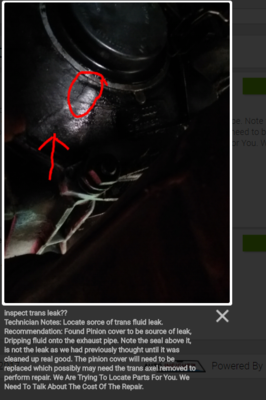 I am told by my local shop that it can be fixed without taking out the Trans, but my concern is what caused the thing to crack in the first place. Has anyone else ever heard of this happening and if so what was the cause? Is this a known issue ? PLEASE give me some input if at all possible. Below is a picture and the shops notes on the issue. If you have VAST DP's please comment! Whoa what a HUGE improvement...Please comment! help me! please comment this CHIP for me.